Architect James Renwick, Jr. (November 1, 1818–June 23, 1895) designed some of the most famous buildings in America. His eclectic style emerged from his background in engineering, his understanding of history, and his worldly views of art and architecture. Renwick's body of work spans a variety of architectural styles throughout the United States, and two of his buildings, the Smithsonian Institution Building and the Renwick Gallery, are a part of the Smithsonian Institution. Born in the Bloomingdale District of Manhattan, New York, Renwick's parents Margaret Brevoort, a member of a well-established New York family, and James Renwick, an engineer and professor of natural philosophy at Columbia College, now Columbia University, provided the young man with a cultured lifestyle. 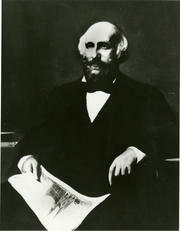 Following in his father's footsteps, Renwick entered Columbia College at the age of twelve and graduated in 1836. He received an MA three years later. After working as a structural engineer for the Erie Railroad, in 1843 Renwick entered a competition to design the Grace Episcopal Church in New York City. Despite his lack of formal training, Renwick won the competition to design the church. His winning design followed the English Gothic style. In 1846, Renwick won the competition for the design of the Smithsonian Institution Building or "Castle." For this building, Renwick utilized numerous architectural styles and his knowledge of architectural history. The Castle design consisted of different architectural styles that came from 12th century Europe, sometimes called Saxon, Norman, Gothic, or Romanesque. It was this Romanesque style that was requested by the Board of Regents of the Smithsonian. However, Renwick skillfully intertwined Gothic elements into the Castle, including rose windows, vaulted ceilings, and tall thin windows. After completing the Castle, Renwick went on to design what is considered his finest achievement, St. Patrick's Cathedral in New York City. Started in 1858 and opened in May of 1879, the cathedral is a mixture of the German, French, and English Gothic influences. Renwick's notoriety continued to grow and in 1859, he was commissioned by William Wilson Corcoran to design a gallery to house his personal art collection. Constructed between 1859 and 1871, the original Corcoran Gallery of Art's design embraced the Second Empire style. 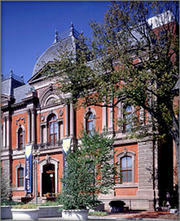 Today, the building now houses the Smithsonian's Renwick Gallery. Renwick's prominent career also included the design of Saint Bartholomew's Church (1871–1872) in New York City, Second Presbyterian Church in Chicago, Illinois (1872–1874), and All Saints' Roman Catholic Church (1882–1893) in Harlem. These buildings, along with other Renwick structures, display Renwick's reputation as a brave and experimental designer, who combined many different architectural traditions in order to create a new American style.